Currently, Denver Metro and the North Front Range regions are in non-attainment for ozone (as mentioned on the NFRMPO’s Air Quality page). So, what exactly is ozone and how does it impact you? These helpful graphics from Simple Steps, Better Air (SSBA) provide information about what ozone is, where it comes from, and how it can impact your everyday life. Ozone is created from Nitrogen Oxides (NOx) and Volatile Organic Compounds (VOC) reacting with heat from sunlight. Colorado summers are hot, dry, and sunny, providing the heat needed for this reaction to happen. This explains why there are more Ozone Action Days in summer than any other season. Ozone Action Days are posted by the Colorado Department of Health and Environment (CDPHE) when ozone levels could potentially reach unhealthy levels for sensitive people. 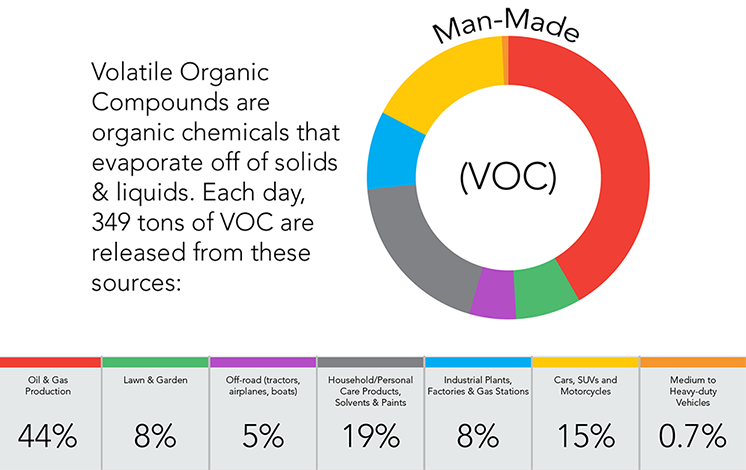 What exactly are NOx and VOCs and where do they come from? 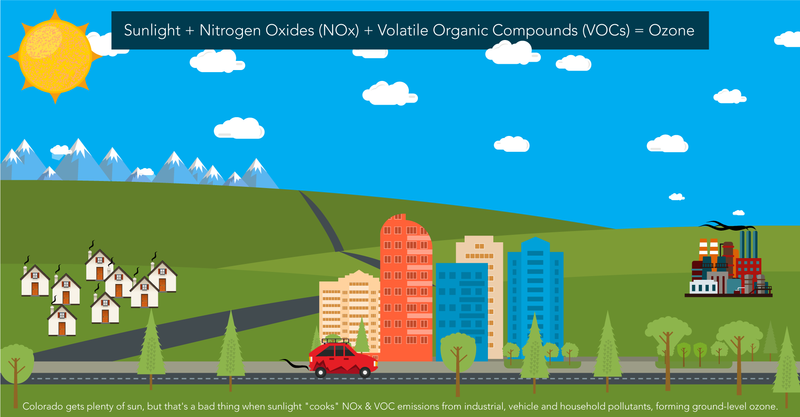 These graphics from SSBA provide a quick explanation of what causes NOx and VOCs to form. Knowing where these gases come from can make it easier to change your habits. For example, riding your bike or combining errands reduces emissions from vehicles, which currently produce 22 percent of NOx and 15 percent of VOCs. Mowing your lawn in the morning when the sun is not as strong reduces emissions from lawn and garden sources. 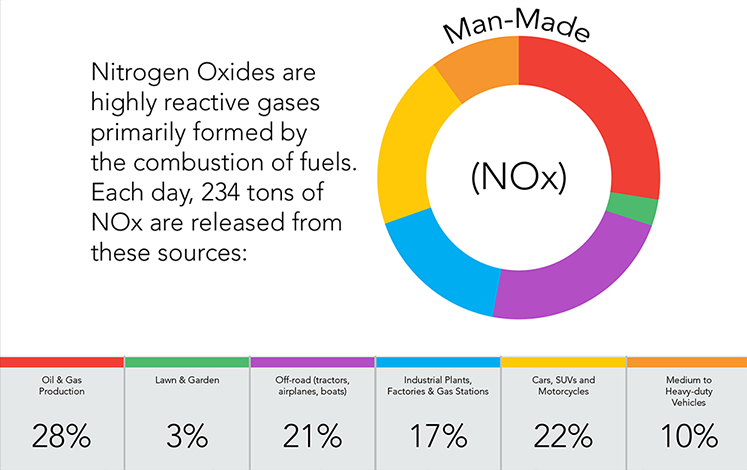 These account for 3 percent of NOx sources and 8 percent of VOCs. Simple steps have a big impact. What are a few simple actions you could take to reduce ozone? Use transit. Ride your bicycle or take a walk. Mow your lawn and refuel your vehicle earlier in the morning or at night. Choose low VOC products. When you refuel your vehicle, stop at the first click of the nozzle. Interested in teaching your child about air quality and how they can make an impact? Download an activity book from Simple Steps. Better Air. These graphics are used with permission from the Simple Steps. Better Air. program. The campaign is a great resource to find out more about ozone and air quality, and the simple steps you can take to improve the air for all Coloradans.